Backed by fellow Chicago Teachers Union officer Kristine Mayle, President Karen Lewis attacked Gov. Bruce Rauner, saying, "People need to know who is the bad guy and the bully in this." 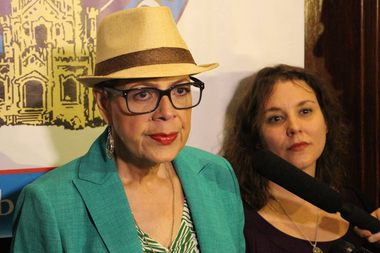 RIVER NORTH — With the "countdown" running on a possible Chicago Teachers Union strike next month, President Karen Lewis addressed the City Club on Wednesday, lashing out at Gov. Bruce Rauner and calling him "the new ISIS recruit" and a "liar." "Rauner lacks the ability to govern," Lewis added. "He purchased his seat, conned the people of Illinois and is clueless on how to turn around Illinois to better serve its citizens." She accused him of "clouting his daughter into Walter Payton High School" and suggested he reimburse Chicago Public Schools $47,000 for her education. "Maybe we ought to call the governor and ask him to pay his fair share," she said. 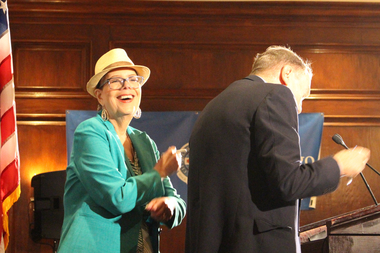 Chicago Teachers Union President Karen Lewis finds something to laugh about during her question-and-answer session at the City Club, moderated by Paul Green. Later, in a news conference with reporters, Lewis didn't back down from her blistering attack on "the so-called governor," saying, "People need to know who is the bad guy and the bully in this." Rauner's Press Office issued a statement in response saying: "This kind of rhetoric has no place in American public discourse and sets a terrible example for our kids." Almost lost in the flurry was the strike the union has threatened in mid-May if it doesn't reach a new contract with CPS. "Is the City of Chicago headed toward another teacher strike? Yes," Lewis said, then quickly added that "no decision has been made" on if or when a strike might be called. "The state doesn't appropriately fund public education," Lewis charged. "You get what you pay for. You don't want to pay for stuff, you're gonna get raggedy stuff." Asked if the union would accept CPS Chief Executive Officer Forrest Claypool's call for the two sides to enter into binding arbitration, she responded with an unequivocal, "No!" Lewis charged that the January deal offered by CPS, and basically re-endorsed by a fact finder's report issued last weekend, would actually cut teacher pay over four years, while offering "no solution to ballooning class sizes." She called on the state to adopt a progressive income tax and consider a financial transaction tax on Chicago trading markets to better fund education. She rejected a question from the audience asking if the union was posturing politically, saying, "We are not petulant little children." Lewis said the school district's woes were part of larger social problems involving poverty and crime, especially among minorities in Chicago. Her lunch speech came days after the union rejected a fact finder's report in contract talks with Chicago Public Schools, a report that Lewis called "dead on arrival" in her speech. Rejecting the report kicked off a 30-day "cool down" period before a strike could be called in mid-May. That followed a one-day strike called by the teachers union April 1 over what it called inadequate state education funding. At the time, Lewis addressed thousands of supporters at the Thompson Center and called Rauner a "terrorist" for tying a state budget compromise to his anti-union "turnaround agenda." Earlier Wednesday, Claypool called on the union to agree to binding arbitration in an open letter to Lewis. Expressing disappointment that the union had rejected the fact finder's report, Claypool said a strike — whether next month or at the start of the next school year in the fall — would be "devastating to our students and parents." Claypool said a strike would serve no purpose, with teachers and the district in agreement that they need more state funding, and he called on the union to agree to binding arbitration and to join in lobbying Springfield for education funding reform. Claypool suggested Interest Arbitration be engaged in the talks, citing its previous work on Chicago Police and Fire department contracts. He asked for a response from the union within a week. The union immediately rejected that offer, calling it "a publicity stunt," a line echoed by Lewis in her speech. Union spokeswoman Stephanie Gadlin pointed out that police and fire unions can't strike, thus their willingness to accept arbitration. "Binding arbitration puts our fate in the hand of a single person rather than our nearly 30,000 rank-and-file members," she said. According to Gadlin, union members are already in Springfield during the public schools spring break lobbying for more education funding. Yet Lewis told the audience that the union was not working with CPS in its lobbying efforts Downstate. "We're not going hand in hand with them to cut our own throats," she said. The countdown to a strike continues to run, Lewis said, adding, "We have 26 days to work something out."